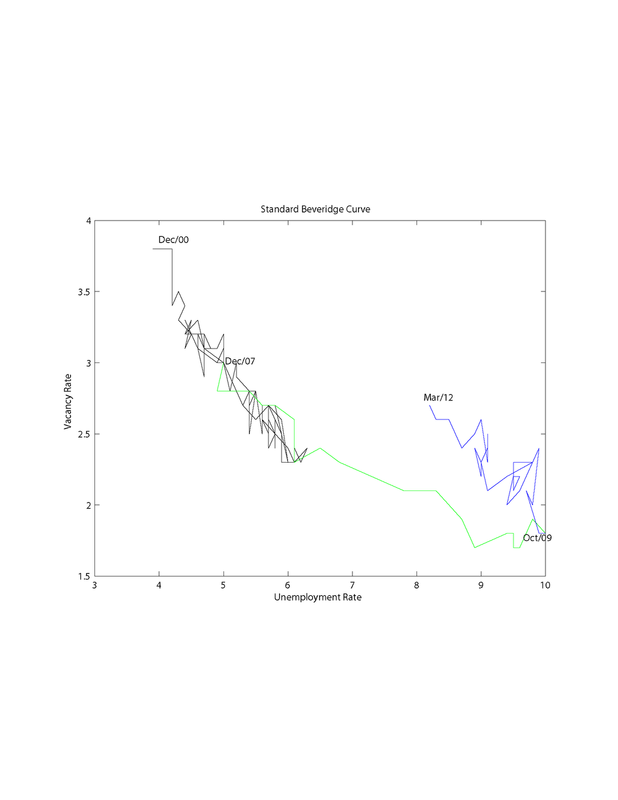 It's well known that the Beveridge curve relationship (the negative correlation between the unemployment rate and the vacancy rate) shifted out as the unemployment rate began to come down from its peak of 10% in late 2009. The first chart shows the most recent update. The data in the chart runs up to March 2012, the latest date for which we have JOLTS data. 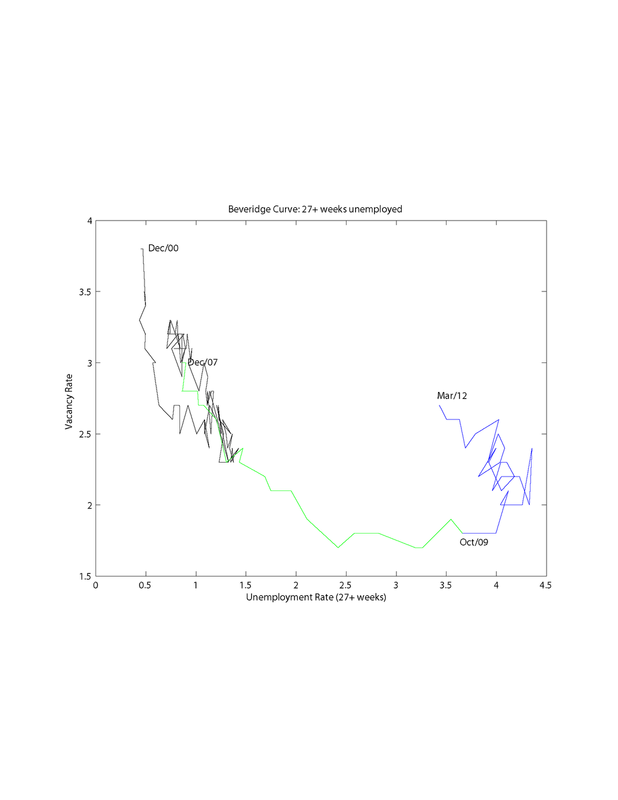 The unemployment/vacancies data from December 2000 to December 2007 (the beginning of the last recession) trace out what is apparently a stable Beveridge curve. As well, the data from December 2007 through October 2009 is consistent with that stable Beveridge curve, but the post-October 2009 observations make it appear that the relationship has shifted. If we had thought that the 2000-2007 Beveridge curve was structural, we would have predicted an unemployment rate of 5.25-5.5%, conditional on the observed vacancy rate in March 2012. But the actual unemployment rate in March 2012 was 8.2%. 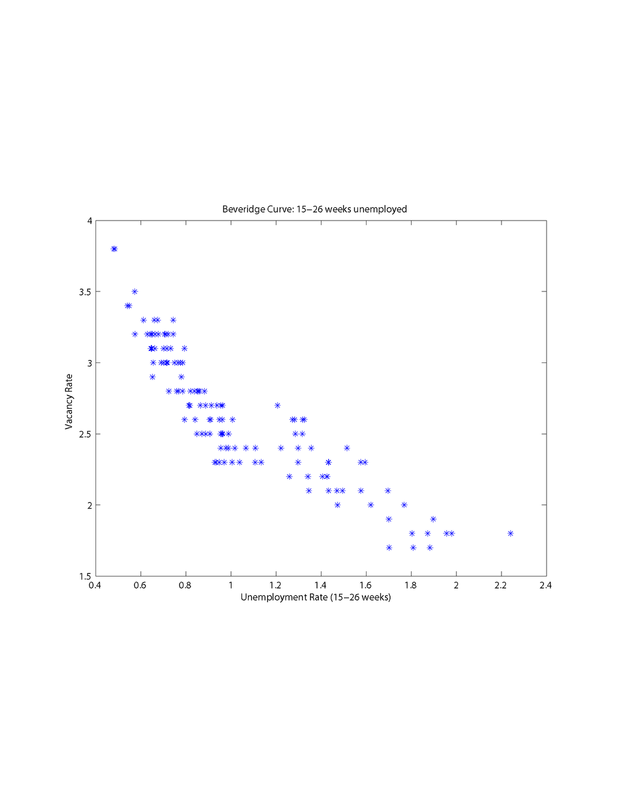 Suppose that we disaggregate, and look for Beveridge relationships in terms of duration of unemployment. 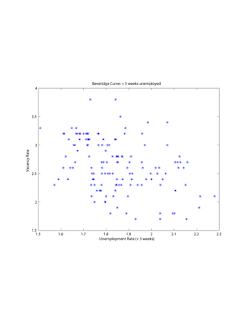 The second chart is a scatter plot of the vacancy rate vs. the unemployment rate for those unemployed less than 5 weeks (those unemployed less than five weeks divided by the total labor force). In this chart, you don't see any correlation at all. 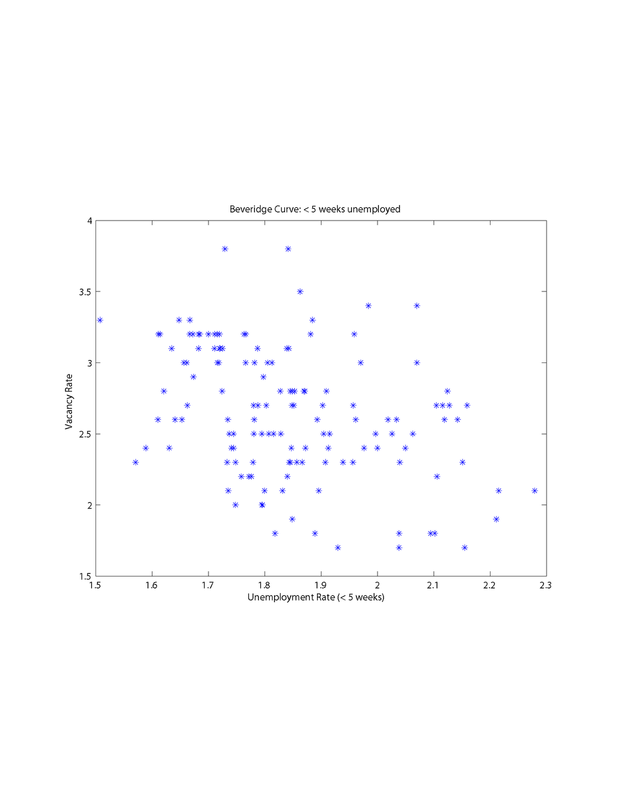 But in the next two charts, you get nice Beveridge curve correlations, for those unemployed 5 to 14 weeks, and 15 to 26 weeks respectively. So, now you know what group has to be explaining the shift in the Beveridge curve in the first chart. The next chart is for those unemployed 27 weeks or more. In this chart I have connected the dots and supplied some dates. The shifts you see in the Beveridge curve in the first chart seem to be entirely due to what is going on with the long-term unemployed. Further, in this last chart you can see an earlier shift, which occurred after the 2001 recession. Finally, let's take a look at the number of those unemployed 27 weeks or more, as a fraction of total unemployed, since 1948. 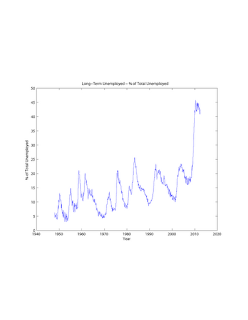 Long-term unemployed as a fraction of total unemployed increases in all recessions, for obvious reasons, but the behavior of the time series after the last 3 recessions is striking. After the last 3 "jobless recovery" recessions, the fraction of unemployed who are long-term unemployed has remained persistently high. 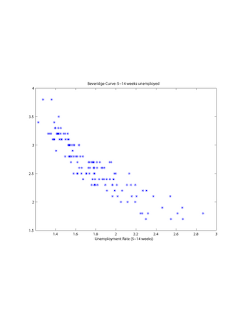 The most recent recession is just an exaggerated version the the previous two - the long-term unemployed account for an extremely high fraction of total unemployed, and that fraction is persistent, just as in the previous two recessions. So, where do these observations lead us? The unemployment rate is currently unusually high, and high in a way that does not appear to be consistent with posted vacancies. 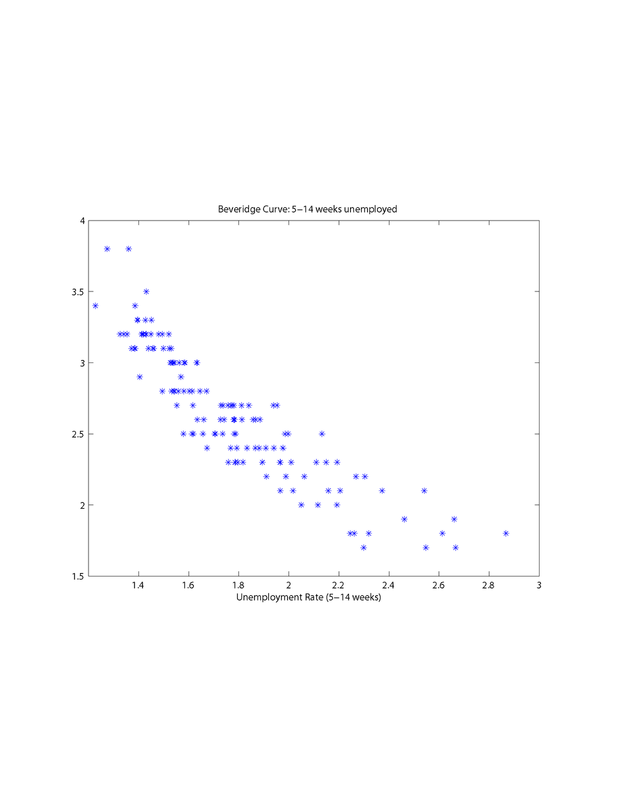 But if we disaggregate, it seems that the characteristics of the time series might have a lot to do with the fact that there are much more long-term unemployed now than is typically the case. But why has that happened? Especially since the phenomenon appears not to be new (going back to 1990 at least), it's hard to avoid thinking about mismatch. 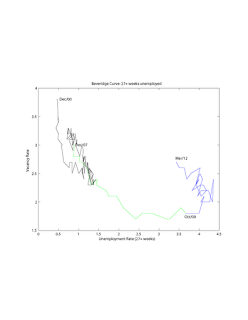 But in order to evaluate that story, we need more information about the long-term unemployed. How many of these are former construction workers? How many are David Autor's middle-skill people? 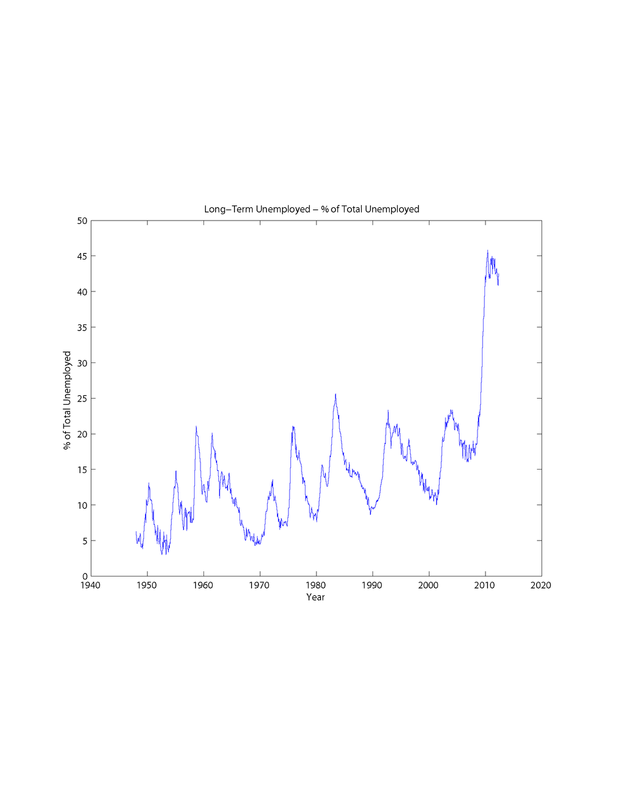 Possibly the financial crisis merely increased the rate of structural change that was already occurring in labor markets? Are there other features of the long-term unemployed we need to be thinking about? 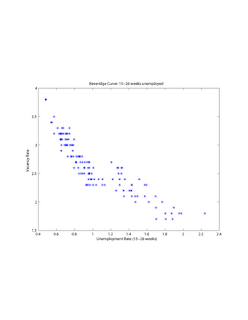 The long-term unemployed may have depreciated skills; they may have been picked over as a group and be of perceived low average quality. Their search effort may be low. All of these things matter for policy, particularly for unemployment insurance programs. What is clear is that conventional models typically have insufficient heterogeneity to explain these facts. 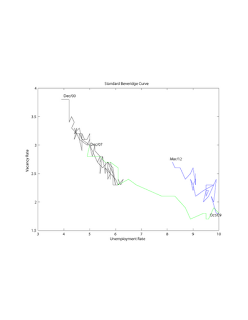 In Mortensen-Pissarides models, for example, labor is homogeneous, and mismatch is embedded in reduced-form matching functions. I'm interested in learning about work you know about that either already captures this stuff, or could potentially do so. Interesting. Looking forward to the paper. Useful post, thank you, Steve.